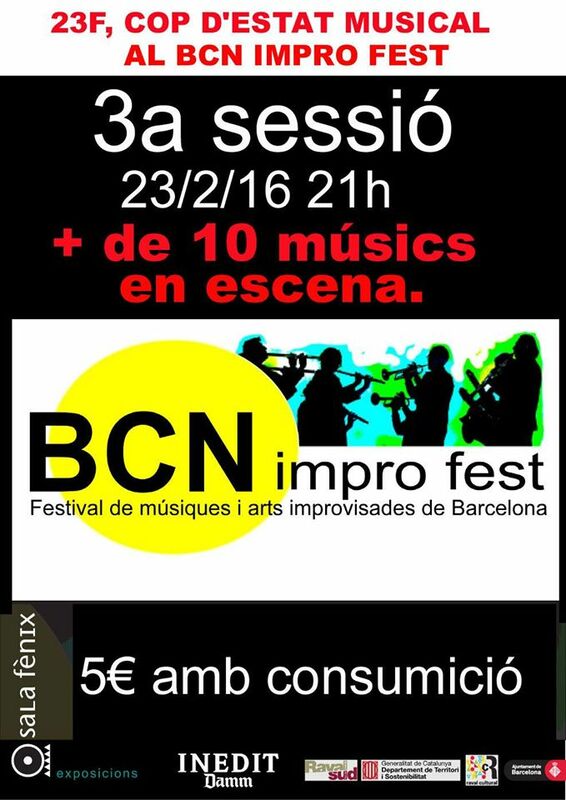 What do we have for this week’s BCN Impro Fest ‘surprise’? What else but Memoria Uno in its eighth live incarnation. The Memoria Uno project has become strongly symbolic of the the Barcelona improvised music scene. Alongside the Thursday sessions at Robadors 23, and the Wednesday Nocturnae Discordianae at Soda in Gràcia, the Memoria Uno performances at Sala Fènix are a revolving showcase for the city’s improvising talent. The first surprise is that Iván González is playing, handing the conduction duties for this first set to Josep-Maria Balanyà. With an early tuba rumble, instruments are cued one by one and few by few, building a slow rumble of anticipation. The woodwinds throw out a brief scream before bass clarinet and tuba emerge from the maelstrom. Another brief all-in frenzy and then it’s the turn of the twin basses to bow behind a brief compacted trumpet solo from González. There’s a defined style here, a sense of space and the establishment of simple rhythmic devices and drones over which canvas individuals are invited to throw their colours. Bagés’ guitar provides sustained single-note feedback contrasting with González’s frantic trumpet… Cirera sets up a simple drawn-out tenor riff as a backdrop for mournful tuba, trumpet… Roca’s brushes work overtime in a free drum’n’tenor duet. Bagés drops harmonics into a dense cloud of the combined brass and woodwind… It’s all about combining the different puzzle pieces to make new pictures. For the second piece, Balanyà settles at the piano and González lays down the trumpet to conduct. In a deliberate contrast, we begin with everyone: a dense organic mass of sound, throbbing and swelling, laced with guitar feedback – a palate-cleansing catharsis before bringing everything down, leaving just drums and piano, soon joined by Nästesjö’s bass… Muñoz is cued in to create a momentary quartet that begins with something almost hard bop-like before pushing the lines to breaking point and beyond. After a series of varying textures, an impassioned flute solo is set against a single, effects-driven guitar chord and both basses. As Brox lays out, Roca steps in and over a guitar-bass-bass-drums rhythm, González adds everything else, one instrument at a time, building volume, tempo and structure for a final massive sound before a joyous twin bass clarinet finale from Bayer and Rocha. Incidentally, this performance came just a few days before Memoria Uno’s first performance outside of the city, at the 26th Festival de Jazz de Granollers and the release of the second disc on Discordian Records – busy week!